as i'm sitting cozily on the couch, watching vampire diaries (my latest addiction from netflix),eating lucky charms & blogging, austin is fishing. that's right.... fishing... at 1:30 a.m. i'm not exactly sure why, but he & nick thought it sounded like a marvelous idea & off they went. i guess boys will be boys. so while i'm waiting for austin's return, i've finally uploaded pictures of our little nest & have decided to give a tour. first off: the bathroom. it's tiny & it's perfect. 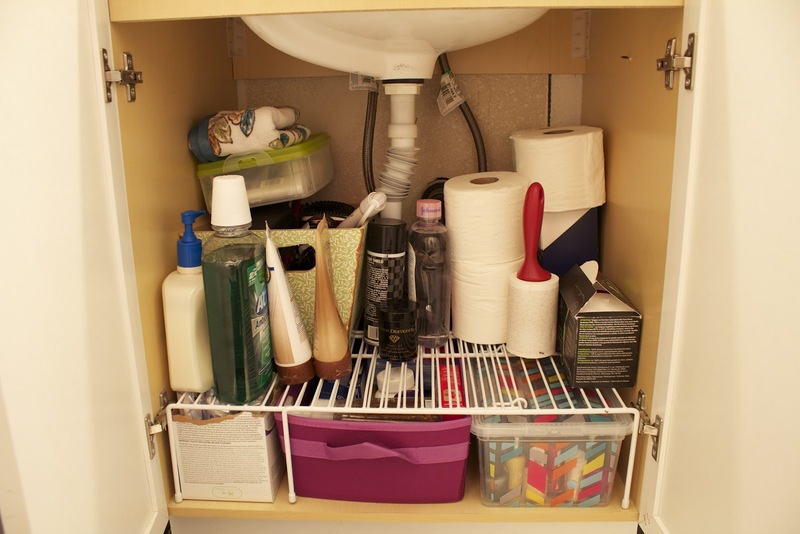 we've figured out how to fit everything & to reduce the clutter that seems to come with bathrooms. our bathroom came with a mirror vanity & a little cupboard underneath the sink. to give us more space we added the over-the-toilet vanity that i got from target a few years ago. it's the perfect add on. it gives us enough extra space & a couple extra shelves. 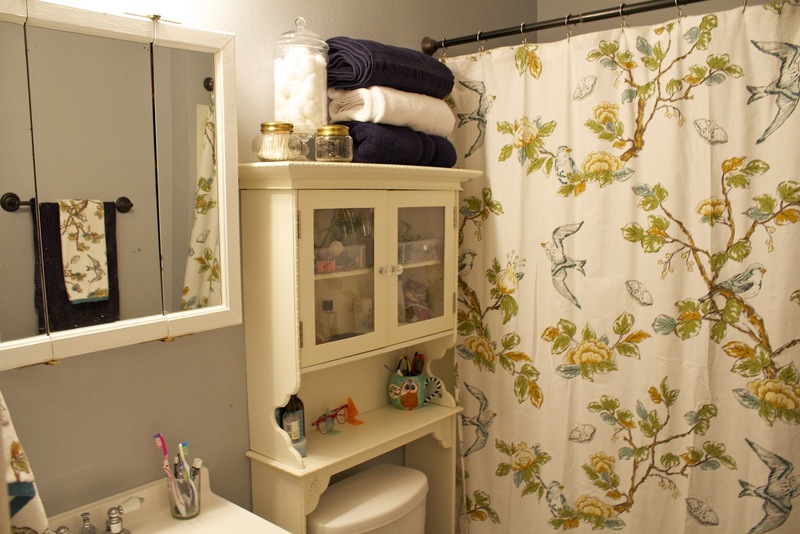 since we have limited space underneath our sink, we keep our extra towels on top of the vanity along with q-tips, cotton balls & all my hair ties & bobby pins. 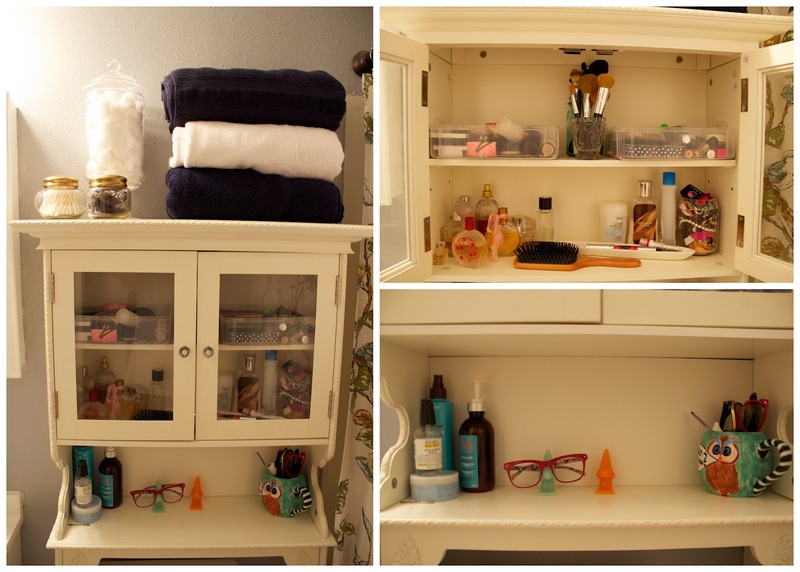 inside the cupboard is makeup, perfumes, & a brush. the shelf underneath holds my hair supplies, glasses & a mug where we keep sunglasses. since it's such a small space, we try to keep this looking as clean & organized as possible otherwise the bathroom will look instantly cluttered. the hardest part has been trying to decide what we absolutely do & absolutely don't need. i know this picture isn't pretty, & it looks pretty crowded, but trust me, we've gone through many times getting rid of things. these are the remains: mouth wash, lotions, toilet paper, wash clothes, nail polish, medicine, a curler & straightener, & a lint roller. to get the most use out of our little space, we've gotten some bins to help us organize & not have too many things just floating about. we also have two racks to gives us an extra shelf, which has helped out a lot. & since little spaces get dirty easily, we clean a little everyday. wipe out the sink & countertop whenever brushing our teeth, & we use a daily cleaner in our bathtub. doing these little things really do add up & help a lot. i bet anyone that knows me is surprised. Love this! You are giving me some great ideas! Kerry I just love your blog...I've seriously been waiting and waiting to see some pictures of your new apartment and they did't disappoint! Soo cute!